Quick. What’s the most over priced tourist attraction in London. For our money, it’s Madame Tussauds. At £22.50/$32.52 to see wax representations of Posh and Becks, we reckon there are about a thousand better things to do in this fabulous city with your time and money. But tomorrow, any American in London with “appropriate documentation” can get in to Madame Tussauds for free to see the new wax representation of our 44th president. And at that price, it’s a bargain. 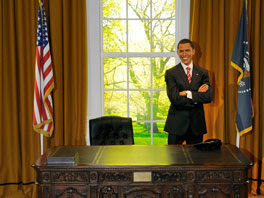 “Standing in a recreation of the legendary Oval Office, President Obama is in a typical informal and relaxed pose, smiling with arms casually folded, dressed in a tailored suit. Tomorrow, before the TV coverage commences, we’re grabbing our passport (not our wallet) and heading for Madame Tussauds. Right on, Washington!